Thank you for your e-mail of yesterday (reproduced below). As I have informed Mr Madden (Senior Social Worker), I am now waiting for my brother (Mr Gerald Finnerty) and my half-sister (Ms Marjorie Dolan) to consider the contents of your e-mail to me of yesterday, and for them to let me have their comments regarding it. I would ask you to please take very careful note of the fact that I have not misconstrued, in any way, what Marjorie has related to me in telephone conversations regarding your alleged comment to the effect that "human rights law was a complete waste of time". In the meantime, I would like to point out to all concerned that your e-mail to me of yesterday makes no mention at all of my legal rights under human rights law. "Actions speak louder than words" Mr Nolan, and your actions, and those of Justice Minister Michael Mc Dowell, all suggest to me - in the strongest possible terms - that neither you, nor Minister McDowell, have any regard whatsoever for my legal rights under human rights law. Similarly, for all of the several other lawyers I have tried to get help from to date (since 2002) regarding the issues in question. Consequently, and with due regard for the fact that I have been charged with a criminal offence (which may involve me having to serve a prison sentence in the Republic of Ireland), what I would like to have from you now is a clear statement (in writing please) regarding what you consider to be my legal rights under Article 6 of the European Convention on Human Rights: in relation to the preparation of my defence for the criminal offence I was charged with in 2002 - shortly after I tried to publicly raise questions (using the http://www.finnachta.com/ Internet address sign at my brother's business premises in New Inn) regarding alterations to the Waste Management Act (Republic of Ireland) which I, and many others including one time Minister for Justice Ms Nora Owen, strongly suspect are a straightforward and blatant violation of Article 28A.1 of the written Constitution of the Republic of Ireland, and which were introduced (as far as I know) during the period when Minister McDowell was Attorney General. It would appear that Minister for Justice McDowell believes he can personally override the Constitution of the Republic of Ireland without holding a constitutional referendum? To the very best of my knowledge, and please correct me if you believe I am wrong, Minister McDowell has no authority whatsoever to do any such thing. As a DIRECT result of the alterations to the Waste Management Act referred to above, and as I feel sure you already know, there are now plans to locate two huge rubbish dumps within a mile or so of my home in New Inn. Based on what local people are telling me, it seems that the construction of one of these two dumps (i.e. the one in Kilconnell owned by Greenstar / National Toll Roads) is now almost complete. Later today I will send a printed and signed copy of this e-mail to you through the registered post. Translation facilities will be provided at the above address. I look forward to hearing from you regarding the above matters at your earliest convenience: keeping in mind, if you would please, that what I and many others believe is a completely unlawful rubbish dump (created by means which are wholly repugnant to the Constitution of Ireland on several counts) may be about to open up at any time now beside my home in New Inn. Dr Michael McCavert GP (Omagh Medical Centre, County Tyrone, Northern Ireland). Subject: RE: Council of Europe asked to investigate Justice Minister Michael McDowell TD (Republic of Ireland). I write in reference to your email of the 25 November 2005 which was received here whilst I was away on annual leave and to your email of the 20th inst. the contents of which I note. You are aware that I am currently acting on behalf of Gerald Finnerty and Marjorie Dolan pursuant to my meeting with them in our office on the 13th October 2005 last. At the end of our above mentioned meeting Marjorie and Gerald mentioned the fact that you were living in Northern Ireland and that you had encountered some difficulties with the Authorities in the Republic of Ireland. I understood from the conversation that a bench warrant had issued for your arrest as you had failed to appear in Court pursuant to a summons which had been served on you. It was also mentioned to me that you were attending a psychiatric hospital in Northern Ireland and that you were afraid to return to the Republic due to the bench warrant. It was also mentioned that you were "appealing the summons to the European Court of Human Rights" although no notice of appeal appeared to have been filed in respect of the alleged Court Order. Having heard the brief facts from Marjorie and Gerald I offered to assist your predicament by offering to contact the Gardai to clarify what exactly you were charged with and to take the necessary legal steps to have your case heard and resolved. At no stage did I say that "human rights law is a waste of time or words to that effect". Your attempt to misconstrue the facts of our conversation and copy same to third parties is an extremely serious matter which is tantamount to defamation. I kindly advise you against issuing such correspondence in the future to avoid exacerbating your already difficult situation. 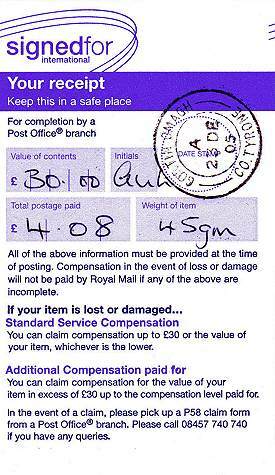 On the basis of my instructions and the facts outlined to me, you have at present no legal or beneficial interest in the lands the subject matter of your email of the 25th November 2005. My clients in this instance are Gerald Finnerty and Marjorie Dolan and I am not in a position to discuss any further private matter of theirs with you. Any further instructions in this matter are to come from Gerald and Marjorie and I am writing to them to confirm same. You will please note the above. 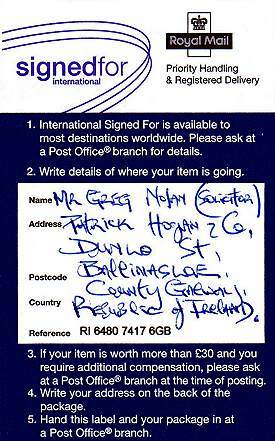 Subject: Fwd: Council of Europe asked to investigate Justice Minister Michael McDowell TD (Republic of Ireland). Please note that I have not received any reply from you to my e-mail letter of November 23rd 2005. I understand that my brother (Mr Gerald Finnerty) and my half-sister (Ms Margie Dolan) have contacted you on a number of occasions in recent weeks regarding the fact that I have not heard anything at all from you. As I trust you will accept, I believe that I stand to lose a great deal of money - perhaps as much as a million Euros, or even more perhaps - if satisfactory progress cannot be made regarding the sale of the 30 acre site at Lisnamult (beside Roscommon town). Similarly, for my brother and half-sister. Correctly or otherwise, I cannot help feeling that the unexplained delays and obstacles I keep running into regarding this matter are in some way connected with the issues referred to below relating to Justice Minister McDowell TD. Very regrettably, I have to say that matters have not been helped (for me) by a report I received several weeks ago from my half-sister Margie to the effect that you advised them both (i.e. my brother and half-sister), during a meeting you held with them in your office on October 13th 2005, that "human rights law was a complete waste of time" - or something very similar to that. It would be much appreciated if you would please clarify your position as soon as you reasonably can please.